On May 20, 2015, Arctic sea ice extent was only 12.425 million square km, a record low for the time of the year since satellite measurements began in 1979. As the Arctic Sea Ice is at a historic low, Alaska faces temperatures as high as 31°C (87.8°F), as illustrated by the image below. 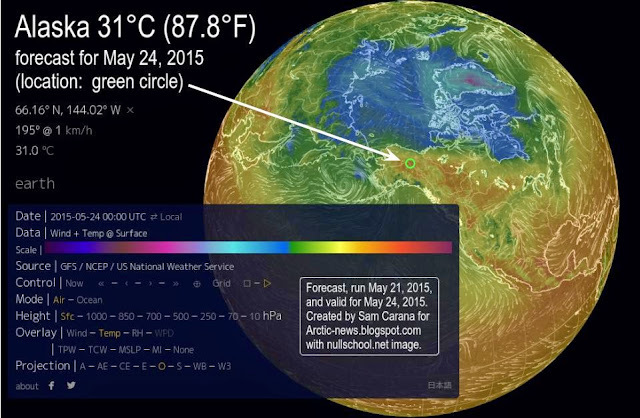 How is it possible for temperatures to get so high at locations so close to the North Pole? 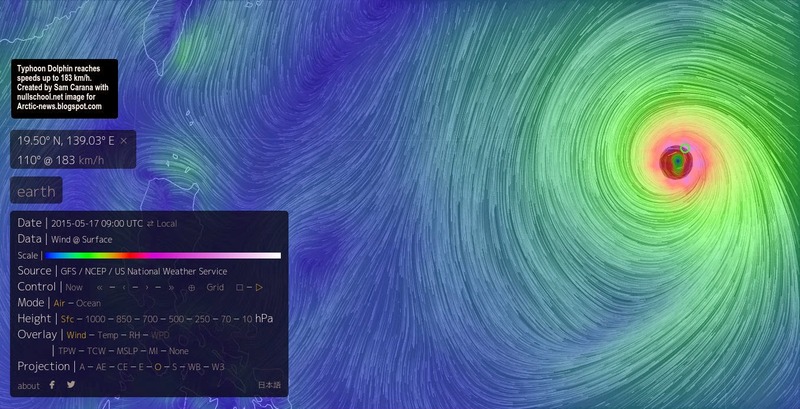 Dr. Michael Ventrice, Operational Scientist at The Weather Channel Professional Division points at two typhoons, Noul and Dolphin, that recently hit the western Pacific Ocean. 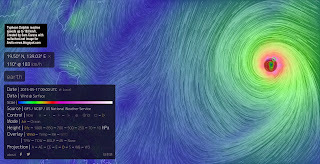 These typhoons do have some impact. Importantly, global warming is increasing the strength of cyclones. In other words, a greater impact of cyclones on the jet stream can be expected as a feedback of global warming. Furthermore, global warming is directly changing the path followed by the North Polar Jet Stream, from a relatively straight path at a latitude of 60°N to a wildly meandering path that at some places merges with the Subtropical Jet Stream and reaching speeds as high as 267 km/h (166 mph) and that at other places moves high into the Arctic and reaches speeds as high as 170 km/h (106 mph). 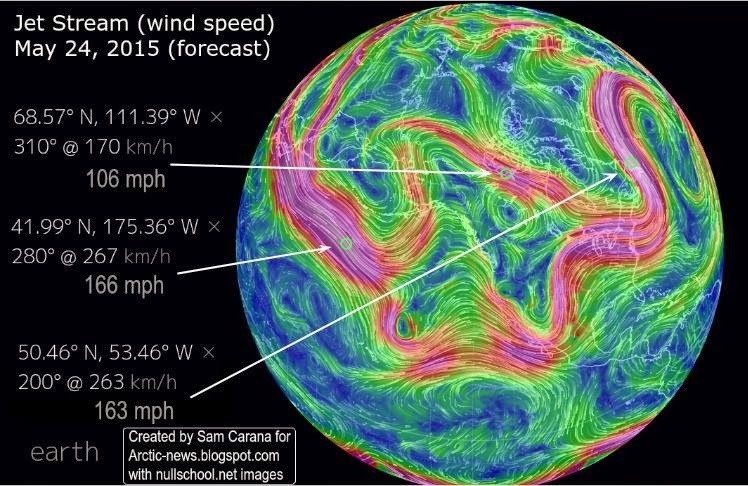 On above image, part of the jet stream even moves right across the pole. Such changes to the jet stream constitute one out of numerous feedbacks of global warming, as discussed at the feedbacks page. 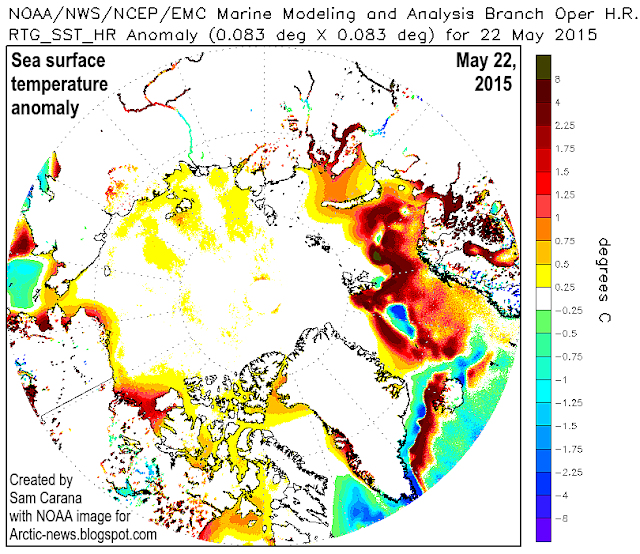 Decline of the snow cover and sea ice in the Arctic is another such feedback. As discussed in earlier posts, heat waves at high latitudes cause thawing of frozen soil and melting of glaciers and snow cover, This results in large amounts of water draining into rivers that end up in the Arctic Ocean. At the same time, heat waves also raise the temperature of the water in these rivers. 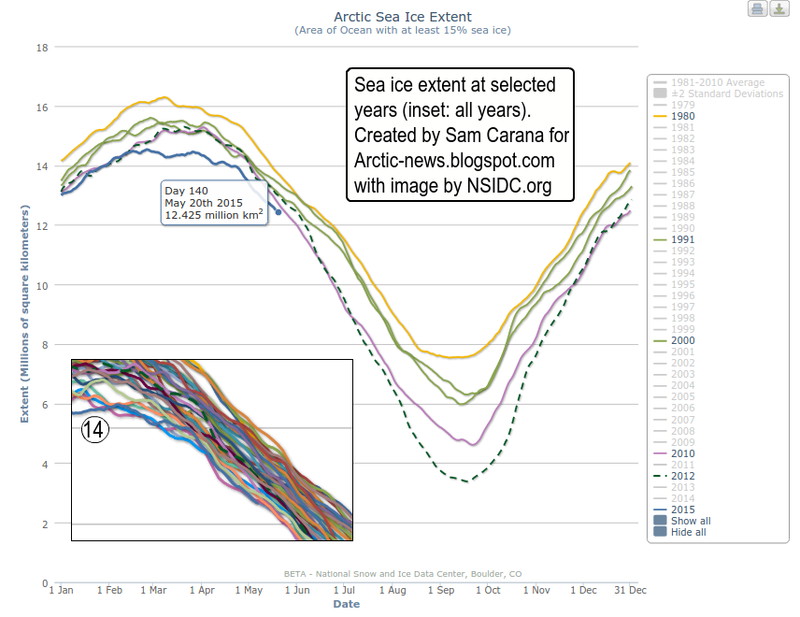 The larger amounts of warmer water result in additional sea ice decline and warming of the Arctic Ocean seabed. Such heat waves also set the scene for wildfires that emit not only greenhouse gases such as carbon dioxide and methane, but also pollutants such as carbon monoxide (that depletes hydroxyl that could otherwise break down methane) and black carbon (that when settling on ice causes it to absorb more sunlight). Above image shows how much warmer the water in the Arctic Ocean is compared to what it used to be, with high anomalies where rivers flow into the Arctic Ocean and where the Gulf Stream carries warm water from the Atlantic Ocean into the Arctic Ocean. The situation looks set to get worse, as the frequency and intensity of heat waves in North America and Siberia increases as temperature at high latitudes are rising rapidly. Furthermore, warm water is lining up along the path of the Gulf Stream, with sea surface temperature anomalies as high as 10.3°C (18.54°F) recorded off the coast of North America on May 20, 2015, as illustrated by the image below. Meanwhile, a very high methane reading was recorded at Barrow, Alaska (hourly average, in situ measurement), as illustrated by the image below. 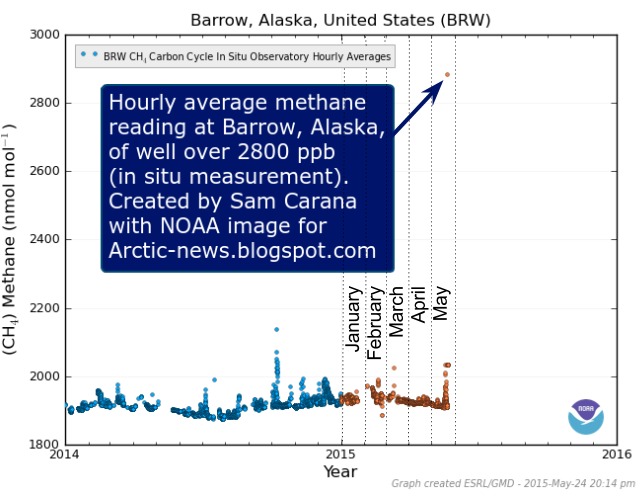 The big danger is that the combined impact of these feedbacks will accelerate warming in the Arctic to a point where huge amounts of methane will erupt abruptly from the seafloor of the Arctic Ocean. The situation is dire and calls for comprehensive and effective action, as discussed at the Climate Plan page. This phenomen is lobal. The Southern Oceans are now so hot that Ausralia has had the most exceptional Autumn in history. We read the same for the Antrctic and Atlantic cyclones, for European weather and so on. There is no escape from these weather shifts as the jet streams collapse chaotically. Predictions are that the heat that has been "lost" in the oceans over the past few years will now play the major role in climate disorganisation. Expect 30C plus in the most vulnerable and unexpected places to support catastrophic bushfires and large methane burps. It looks like Gaia's time has come!